Manel, Paco, and Valerio are some of the people who have lived on the streets and who have given their image to the Homeless Commons campaign. It consists of an image bank made up of photographs of homeless people posing in everyday situations such as eating, meeting with friends, or working in the office, accompanied by volunteers from Arrels. The campaign, which is promoted by the Arrels Foundation and Arena Media, aims to expose the “invisible reality” of homelessness and change the way in which homeless people are viewed by society. “We tend to associate homeless people with alcohol, antisocial behaviour, and violence,” says the organisation. The image bank currently contains 136 photographs of people who have lived on the streets. 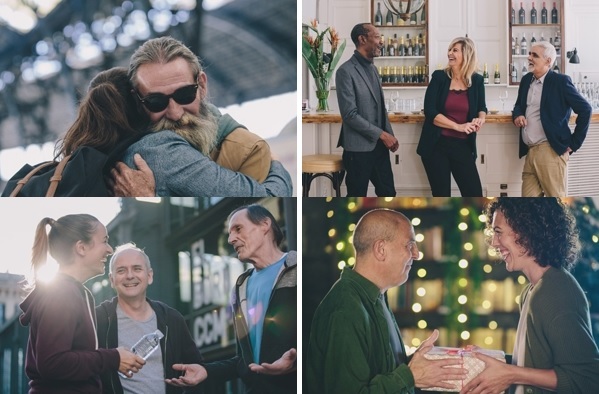 Homeless Commons is working towards changing this image by showing another side to the story, of people who connect with others, who have emotions, who get involved in collective projects and who want to change the views of society. The photographs can be used in advertisements and other creative projects such as corporate materials, web pages, or other professional or personal projects. The images were taken in different locations, for example in a rural house, in offices, in the Les Quinze Nits restaurant or in other spaces such as the Estació de França, the Parc de la Ciutadella, or the streets of Barcelona’s Born district. Those who are interested can buy the complete collection or a themed series of between 40 and 54 photographs. You can also get involved by making a voluntary contribution which will go towards financing the #NobodySleepingOntheStreet challenge in exchange for one image; alternatively companies can commission their own photograph session. Homeless Commons is the first image bank to use homeless people as its protagonists. This initial project is working towards the prospect of creating a fair and supportive licence which bears its name and is inspired by Creative Commons, permitting the free usage of these images, as well as the HomelessFonts typographies and other contributed works, by individuals who wish to invest their profits in the Arrels campaign.